In this week's bite-sized episode, Nicky travels to the campus of Duke University, in Durham, North Carolina, for a day of talks and tastings exploring the shifting status of stinky cheese, offal, insects, and other funky foods. At different times and places, these foods have been regarded as "subnatural"—low-class, disgusting, even unhygienic. But what does categorizing these foods as subnatural say about us, and what happens when we decide that they're desirable, after all? Here are links to the peculiar but fascinating events, ideas, and books we discuss in this bite-sized episode. The term "subnature" was coined by architectural theorist David Gissen in 2009 to describe the less desirable aspects of the built environment: puddles, pollution, and pigeons. His book explores the historical assumptions behind this mostly unquestioned hierarchy in which light, air, and greenery are perceived as "good," while the equally natural dust, dirt, and weeds are unwelcome. It also includes a selection of projects by contemporary architects and preservationists that engage with historical perceptions of subnatural environments and attempt to re-imagine them for the future. 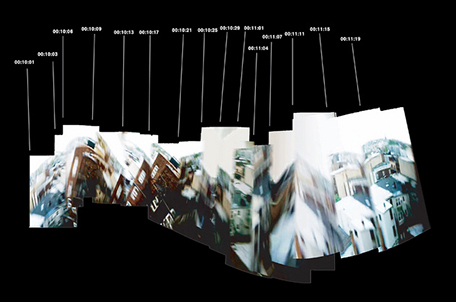 For example, Gissen includes both a discussion of anti-pigeon spikes and a description of the Brooklyn Pigeon Project, in which architecture firm Aranda/Lasch developed a set of algorithms and tools to help humans re-visualize the city from the point of view of a flock of pigeons. By collaborating with colleagues from a wide range of departments at Duke, as well as chefs, cheese-makers, and foragers from the local community, Tom Parker, a visiting scholar from Vassar, created a campus-wide program of events, talks, installations, and edible experiences exploring what the idea of subnature might mean in terms of food, and why particular foods, texture, and flavors have been marginalized in certain societies. Chef Kim Floresca smokes sturgeon at the Duke University campus smokehouse, with Tom Parker and Josh Evans from the Nordic Food Lab. Photo by Nicola Twilley. 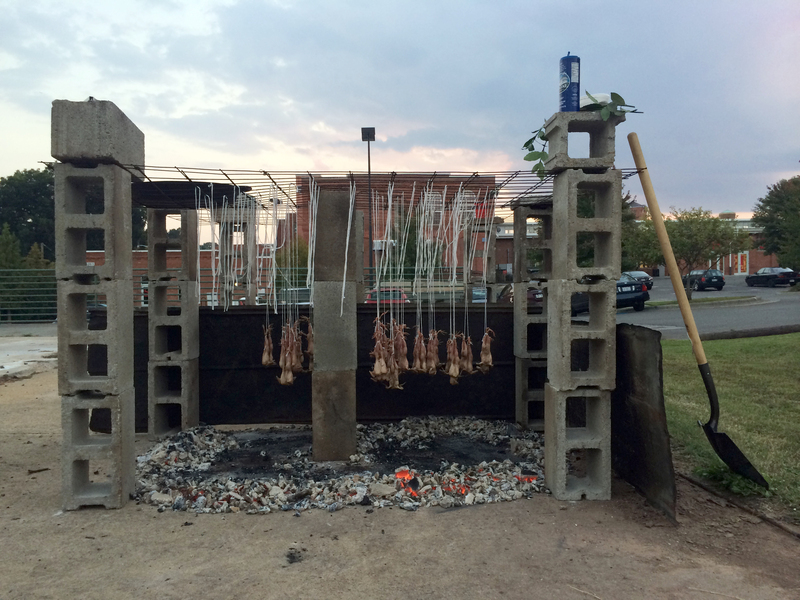 Roasting quail in a downtown Durham parking lot. Photo by Nicola Twilley. 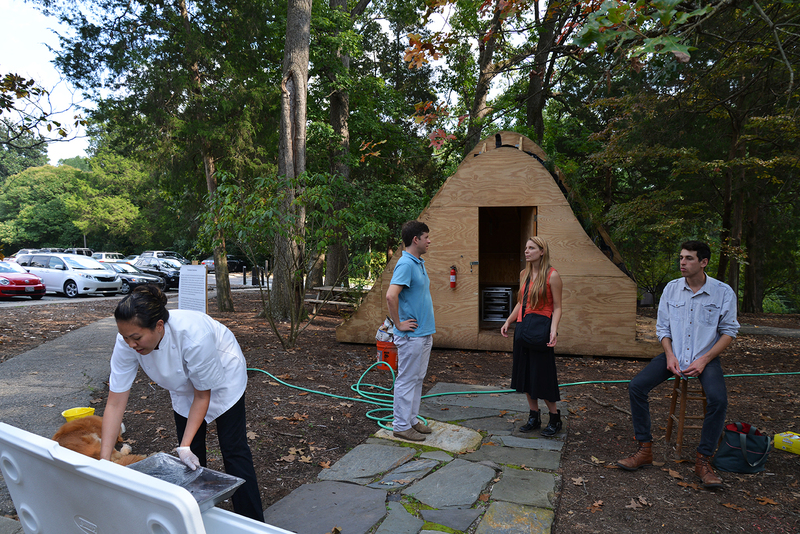 Highlights included the construction of a smokehouse on the lawn outside the university president's offices, as well as a dinner in which the chefs from five local restaurants came together to showcase local subnatural ingredients prepared in transformative ways. 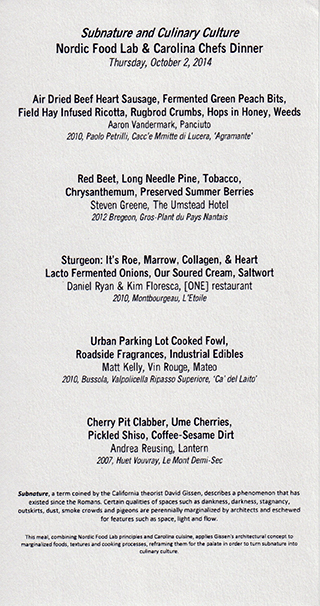 On the menu: car-park roasted quail, cooked using a set-up that chef Matt Kelly described as "redneck ingenuity," and sturgeon coated in a crust of corn fungus and its own heart and collagen, smoked in the Duke smokehouse. 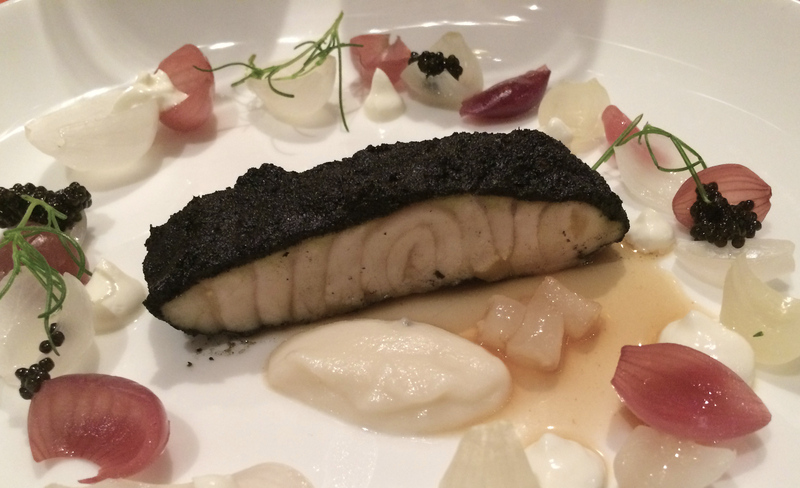 "Sturgeon: Its Roe, Marrow, Collagen, & Heart. Lacto-Fermented Onions. Our Soured Cream. Saltwort." As prepared by chefs Kim Floresca and Daniel Ryan, [ONE] Restaurant. Photo by Nicola Twilley. This is the post about David Gissen's new map of France's wine regions that started the ball rolling by introducing Tom Parker to the idea of subnature. 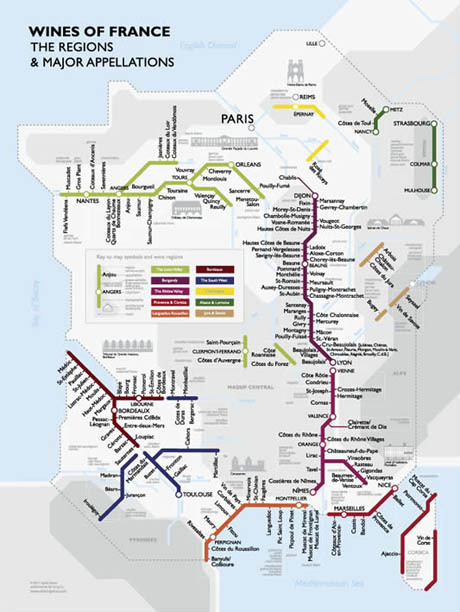 Gissen represents wine appellations as stops on a subway line rather than as geographic territories in an attempt to communicate the relationship between each region, rather than their legal boundaries.